The summer months are full of new opportunities to meet people where they are and point them to Jesus. 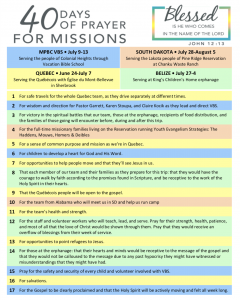 We have set aside 40 days over June, July and August this year to pray with focus and purpose daily for needs related to three missions opportunities. in Sherbrooke, Quebec) and world (King’s Children Orphanage in Belize).